I’m so jazzed to be posting here today! First because I love Andrew and I think he is pretty darn awesome, and second because I try to eat unprocessed most of the year and it makes a HUGE difference when I do! I’m a private chef, so I am always in the kitchen. Whether I am cooking for myself, or for a client, I’m always looking for the best recipes that I can make even healthier by using whole ingredients. I’m also totally obsessed with avocados! Like I think I might have a condition. I don’t think I’ve gone a day in the past few years without eating avocado in some way shape or form. 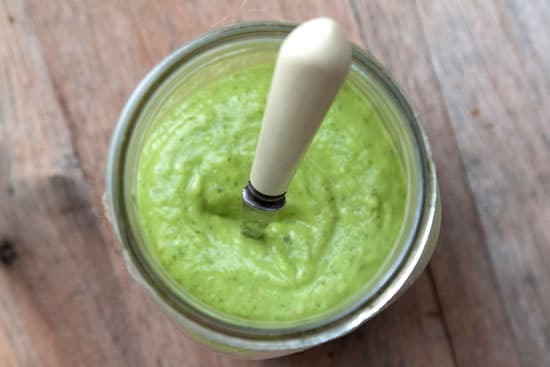 So I’m excited to share my favorite avocado dressing recipe here today! There is something super-comforting about adding a creamy dressing on top of any salad, and avocado is basically the perfect thing to make a creamy dressing without using any weird processed ingredients. This dressing works on farmers market salads that are loaded with fresh fruits and veggies and it also works perfectly on salads that have protein added in too, like grilled salmon, steak, or chicken. Basically you can’t go wrong with this one! It’s so good you could even use it as a dip for some homemade chips. There is something super-comforting about adding a creamy dressing on top of any salad, and avocado is basically the perfect thing to make a creamy dressing without using any weird processed ingredients. Process for 1-2 minutes until the dressing is smooth and creamy. Serve on salads as needed. 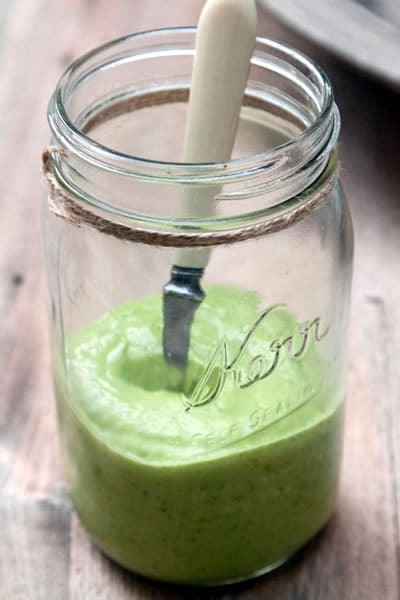 If you are not going to use all of the dressing, store it in an air tight container with a piece of plastic wrap on top of the dressing to make sure it says fresh and bright green! Yummy! Can’t wait to try this recipe! I love avocados, too!! Sounds tasty! Can’t wait to try it. How long is it good for in the fridge?? Hi Alicia! I keep it around for about 4-5 days! I love avocado as well, so can’t wait to try this one!